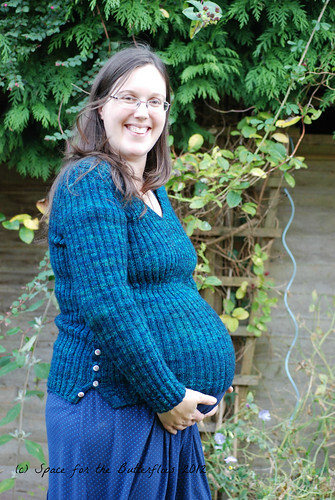 I’m going to claim that deciding to knit a jumper for myself at umpteen weeks pregnant has nothing to do with foolhardy optimism, and everything to do with a perk of the wriggle-bump not being the eldest. The perk bit at least is true, I was unpacking the newborn-3 month vacuum bag back into the baby drawers today and it includes a good pile of gender neutral knitwear (and a lot of pink baby-gros), so I don’t have any worries that this bump will be any the less smothered in knitwear than his or her big sister, and if the weather keeps up its current nose dive into decidedly wintry temperatures, he or she will probably appreciate it. Truthfully, it was a craving. Yes, where other women crave pickles, ice lollies or biting into lumps of coal, I get cravings to knit myself a jumper (and for olives, fresh pineapple and dolly mixture but that’s not important right now). I’m sure part of it is the ‘forbidden fruit’ aspect; none of my measurements right now bear any relation to how I’ll look in a few weeks, or a few months, well my arms will probably stay the same length but you know what I mean. I can’t make anything with a guaranteed longevity, which is a bit of an issue when you’re planning on doing enough knitting to cover at least part of a 6’0″ non-miniature person. But then, in what I shall claim was an initial foray into sorting out my stash in preparation for the new arrival, and absolutely not a bit of yarn flavoured daydreaming, I came across a really great maternity pattern, and the yarn practically fell out of the cupboard into my lap, and well, a girl cannot really be held responsible for the combined effects of Kate Gilbert and Tosh Merino DK when her immune system is already compromised. My friends, I cast on. And I’m so glad I did. Way back in August, chilly autumn days seemed so far away, and I knit along gently, enjoying the rhythmn of a 2×2 rib and the feel of lovely yarn running through my fingers. Thanks to a bit of an intensive push at the end of September (when I realised that it might be a good idea to have finished the jumper before the baby made an appearance) and a trip to Oxford to choose vintagey flower buttons from Darn it n Stitch, it was all sewn up in the first weekend of October, and on it went. I think I’ve worn it for at least some part of every day since, particularly since the thermometer dropped into single digits. It’s warm and cozy, and if I could have done with a little more length, or possibly another set of short rows to give me a bit more bump coverage well (a) I didn’t knit the neckband because I ran out of yarn so that’s wishful thinking, (b) more knitting requires more time, and it’s keeping me a lot warmer wearing it than sitting it in my lap and (c) all other jumpers stop above the bump with the exception of H’s hockey sweatshirts which make me look like a galleon under full sail and tend to come with a side order of astro turf sand in the pockets. 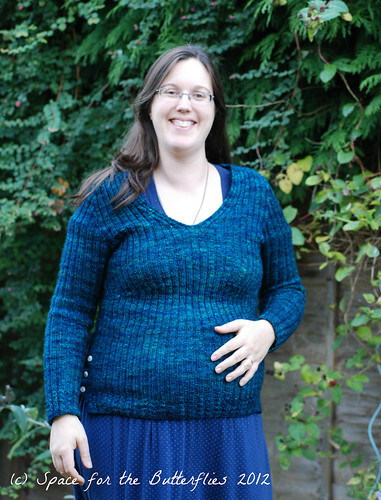 Most people that have made this jumper have started (and finished) a little earlier in their pregnancies, and I suspect have therefore managed to spend more time wearing the finished item than they spent knitting it. Hopefully the same can be said for me, and history (by which we mean Kitty) would suggest that wriggle-bump is unlikely to be early so I think I’ve got a good few weeks wear left (needles crossed – I have a lot still to do). Alterations: I added extra length to the front/back and the sleeves and ended up short of yarn so I’ve left off the neckband but I think you can only tell if you know there should be one. 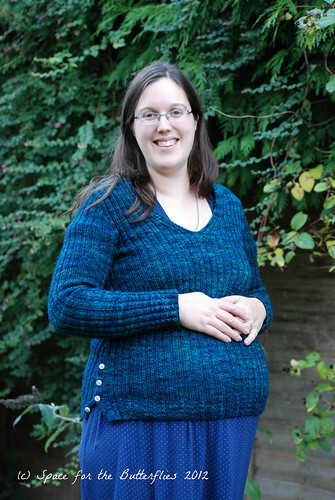 Would I make it again: Hopefully I’ll only ever need one maternity jumper but I would recommend it as a great pattern.